Weeds may not be welcome in your garden, but they can look right at home on your plate. 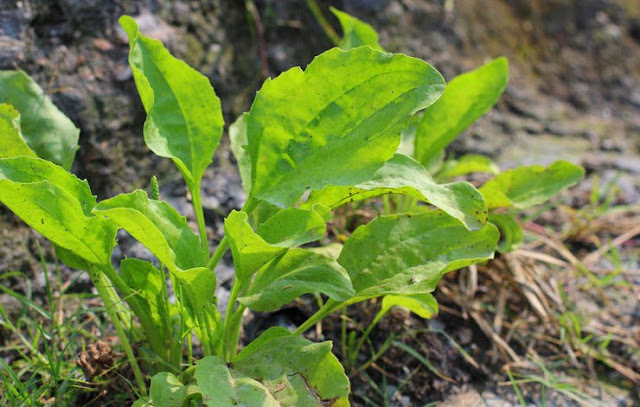 Like your favorite edible plants, some weeds are nutrient-rich or chock full of flavor. And, best of all, they’re Free Organic Food. If you can’t beat them, you might as well eat them. Click through the slideshow to discover five common weeds you can use in your favorite dishes or eat on their own. Common mallow can be found in sandy, loamy, dry or heavy soils, but it prefers well-drained dirt, says Stephenson. It’s a low-growing weed and has circular leaves with toothed edges. Mallow has small white-and-pink flowers and often grows in dense patches, choking out native plants. 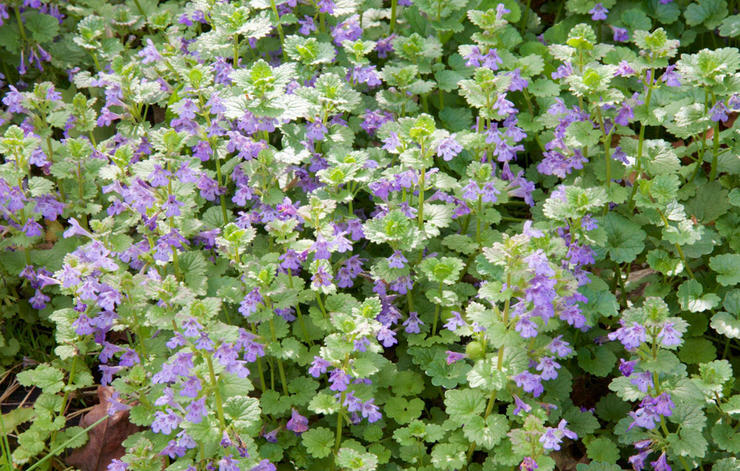 Henbit is a low-growing, sprawling plant with green stems that can turn purple with age. Its leaves are heart-shaped with scalloped edges and covered in fine hairs. The plant also produces tiny dark pink flowers. 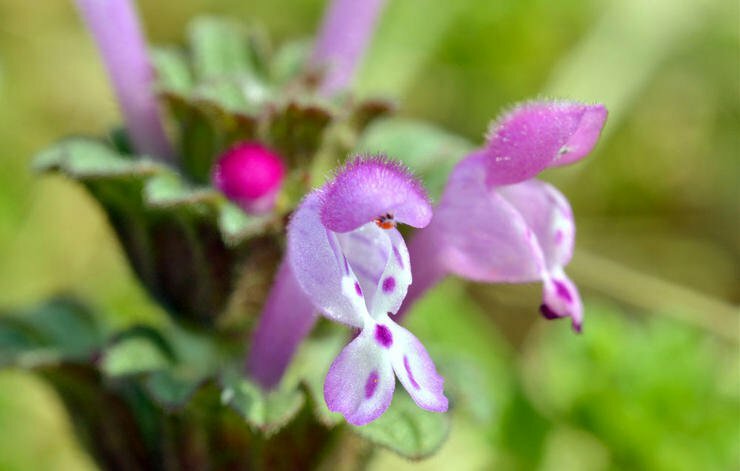 Henbit can grow anywhere with dry or light soil, says Karen Stephenson, a wild food educator and communications specialist for the North American Native Plant Society, who blogs at Edible Wild Food. This includes lawns, parks, and pastures. Henbit has a minty taste and can be eaten raw or cooked. The whole plant is edible, but the leaves are the most commonly consumed part. Typically henbit is to added salads like Arugula + Goat Cheese Salad, but you can use it in soups, stews, smoothies, and other recipes, says Stephenson. The leaves and flowers can also be dried and used as tea. “Cattails are wetland plants,” says Stephenson. 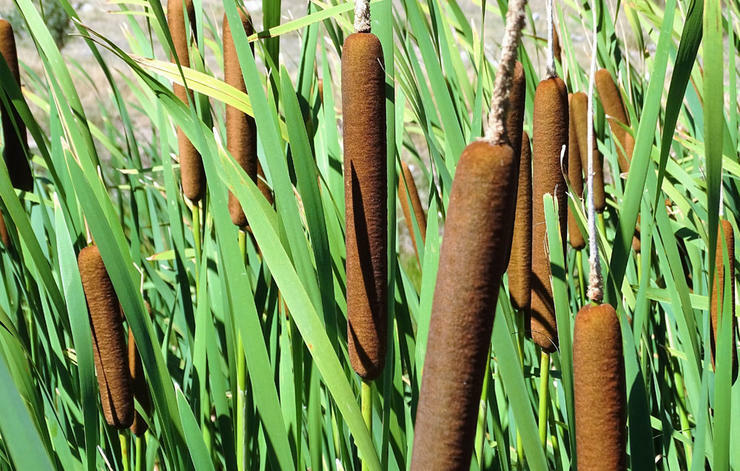 “They are commonly spotted along marshes, ponds, wet ditches, and along shorelines of rivers and lakes.” Cattails can grow as high as 9 feet. Its leaves are long and sturdy, and each plant has a long blossom that’s tightly packed with small flowers. Adult plants are unmistakable, but young plants can look similar to three other poisonous versions, so harvest carefully. “This is a plant where you must know the water source before eating it,” Stephenson says. Cattails purify water, so it’s important to make sure their supply is free of any contaminants. If the water is clean, you can eat the lower parts of young leaves in a salad, says Stephenson. But there’s more; cattails are a diverse plant. The rhizomes can be dried and ground into flour, fresh stalks can be eaten raw, flower heads can be cooked and eaten like corn on the cob, and the pollen can be used as a flour substitute. Despite their identical names, the broadleaf plantain bears no resemblance the better-known banana-like version. These weeds have circularly arranged, egg-shaped leaves with thick stems and a tall stack of small green flowers that sprouts out from the center of the plant. Broadleaf plantains “tend to prefer moist, rich soils and grow in a wide range of soil pH types,” says Stephenson. They grow best in compacted soil, making them a common weed in cities—sprouting up between the cracks in the pavement. The leaves are the most commonly eaten part of the plant. You can eat them at any point in their growth, though they get increasingly bitter as they grow. Stephenson recommends baking plantain leaves like you would in the Kale Chip Recipe—in the oven with a little salt and olive oil. “The seeds can be eaten as well and are loaded with dietary fiber,” she adds. “Creeping Charlie has earned a reputation as being the bane of a gardener,” says Stephenson. “Once it appears in a garden, it is very hard to eradicate.” Creeping Charlie grows close to the ground and loves moist, shady locations and woodland margins. 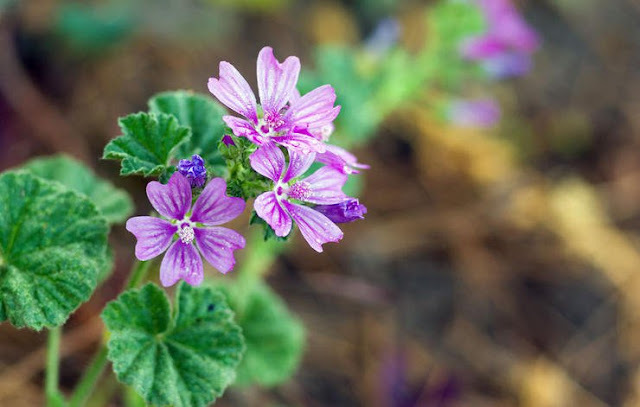 Its leaves are heart-shaped with scalloped edges and its flowers are a light purple.